Spend more time making music and less trying to figure out your gear with Groove3. Enjoy immediate access to over 1600 hours of top-notch video tutorials about your studio tools and gear. Learn your DAW, Plug-Ins, Instruments, Recording, Production, Mixing, Mastering and so much more. Groove3 adds new videos every week, so there's always something cool to learn! From beginner to more seasoned users, there is content to help you in the studio. Be more productive... and less frustrated. 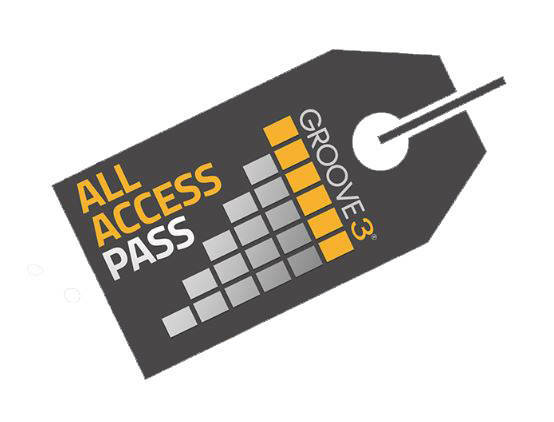 The All-Access Pass is the best investment you'll make in your studio and creative journey. For less than 50 cents a day, you'll have a serious source of information and inspiration about your passion. Imagine knowing your tools inside and out, and how that will improve your workflow and productivity, while freeing up your mind to focus more on the creative process. Get your All-Access Pass today and get into the Groove. • Intuitive player with notes, playback speed, course browsing while in full-screen and much more.